On 10 December 2018, the world celebrated the 70th Anniversary of the Universal Declaration of Human Rights. The Universal Declaration was crafted at a time when the man-made horrors of World War II were still fresh in the minds of world leaders. Seventy years ago, the Universal Declaration set out an ambitious vision for the future. Today, the Sustainable Development Goals seek to make that vision a reality, writes Lise Kingo in her latest Executive Update. It is time for all stakeholders to carry the torch forward and contribute to the realization of that vision — for people and for the planet. The Tenth Principle of the UN Global Compact is a clarion call for companies to fight corruption in all its forms including extortion and bribery. As the world marks the 15th annual International Anti-Corruption Day, read Lise Kingo's statement on how companies can stand united against corruption. When it comes to combating climate change, neither Governments nor businesses can do it alone. To have any chance of limiting global warming to 1.5 degrees C (2.7 degrees F), we need bold climate action from both business leaders and Governments, each of which can push the other forward toward a more prosperous, zero-carbon economy. 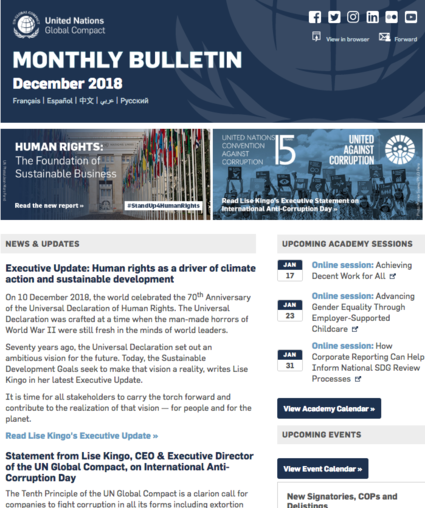 In celebration of the 70th anniversary of the Universal Declaration of Human Rights, the UN Global Compact has released a new report — Human Rights: The Foundation of Sustainable Business — showcasing opportunities for businesses of all sizes and sectors to strengthen and scale up their efforts on human rights. Today’s business leadership standards and commitments on climate change — including carbon pricing, science-based targets, sourcing 100 per cent renewable energy, adaptation and responsible policy engagement — can be significantly to become mainstream practice and help bridge the current gap to keep our planet’s warming to 1.5°C. Join the Pathways to Low-Carbon and Resilient Development Action Platform and become a catalyst for enhancing country-level action to meet the ambitions of the Paris Agreement and the Sustainable Development Goals. All companies have a responsibility to respect human rights. Enlightened companies recognize that embracing human rights is not only the moral thing to do, but also the smart thing to do. The first step is to develop a human rights policy, the most public expression of your company’s commitment to respect internationally recognized human rights standards. The UN Global Compact Action Platform on Decent Work in Global Supply Chains builds an alliance of companies committed to respecting human rights and fundamental principles and rights at work by leveraging their supply chains and taking collective action to address decent work deficits. Join the Action Platform and help build the case for improving decent work in global supply chains and demonstrate how labour rights and human rights are critical for achieving the Sustainable Development Goals. Celebrates the 70th Anniversary of the Universal Declaration of Human Rights (UDHR) and builds upon the UN Global Compact Progress Report. The report highlights insight and initiatives by Global Compact Local Networks around the world, presents snapshots of good practice from companies participating in the UN Global Compact and showcases initiatives that are advancing the UN Guiding Principles on Business and Human Rights. Provides guidance for business and Government to fast track zero-carbon economic growth. The “ambition loop” is a positive feedback loop in which bold Government policies and private sector leadership reinforce each other, and together, take climate action to the next level. Helps businesses to learn more about the UN Global Compact Collection Action Project in partnership with five Global Compact Local Networks in Brazil, Japan, Kenya, Nigeria and Egypt, improve anti-corruption practices within their individual organizations and to engage other businesses, Governments and civil society in anti-corruption Collective Action. Explore the potential of multinational and national enterprises to contribute to the advancement of labour rights and the achievement of decent work for all — a universal goal recognized in the 2030 Agenda for Sustainable Development. Identify the type and extent of childcare support that your company can offer and that best suits the needs of the company’s workforce, complies with applicable law and meets business objectives. Gain insight and examples of how Governments are engaging businesses in their national SDG review processes and how data on businesses’ contributions to the Sustainable Development Goals help inform Voluntary National Reviews.